Cottage season will soon be upon us and those spring mornings can be quite chilly especially when there’s no power. Since there’s no power it means coffee is made in a French press which tends to get chilled very quickly when the air around is cool. Today I’m going to make a cozy for my French press. I want to have triangles in my design and of course they need to be perfect – foundation piecing equals perfect points every time. 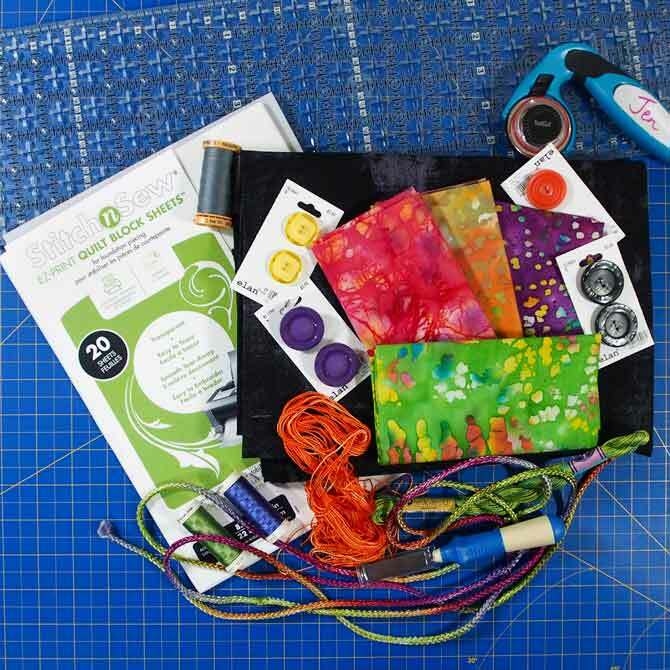 I’ve gathered my tools for this project – lots of embellishments which may or may not get used along with basic quilting tools, thread, fabric in nice bright cheerful colors and Stitch n Sew EZ-print quilt block sheets for foundation piecing from Heat ‘n Bond. These sheets can be used in a printer which is wonderful if you have your template on your computer. As well they are transparent enough that it’s easy to trace the design directly onto the sheet. They are made from a non-woven specially constructed 100% polyester making removal simple by just tearing away in any direction and no distortion of project. Also a perfect product as a machine embroidery stabilizer plus they are machine washable and dry-able. I’ve not used this product before so I’m keen to give it a go to do my foundation piecing for my coffee cozy. First of all I drew out a pattern on a piece of letter sized paper to fit my french press. Then I traced it onto the foundation paper with a fine Sharpie. I used red but any color will work. The sheets are definitely easy to see through for tracing and I didn’t need a light box or window. With my fabric pieces cut I placed the first two pieces on the foundation paper with right sides together. 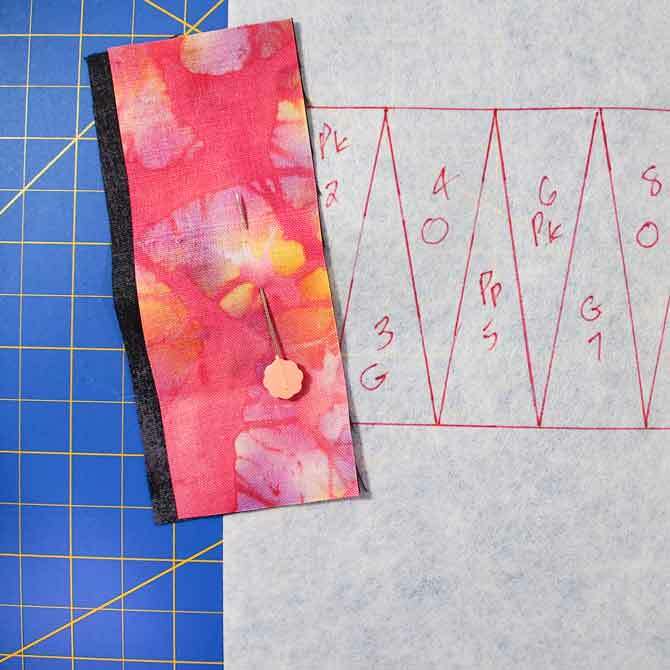 Pinning the two pieces to the foundation paper ensures that they won’t move and that the ¼″ seam allowance remains. There should be a ¼″ of fabric beyond the sewing line. In order to make sure placement is correct I held the fabric and paper up to a light like Stella or a window to ensure the fabric was in the right place. Sewing from the backside I used a bit shorter stitch and followed the red line. Even though the red line was drawn on the front it was very easy to see and follow from the backside with the paper being so transparent. 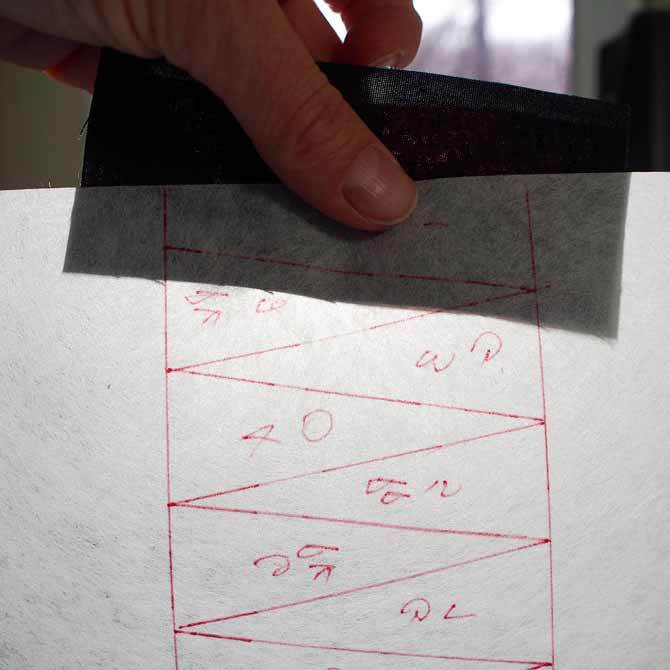 The shorter stitch makes removal of the paper easier. Finger pressing works very well for foundation piecing and it means you can stay sitting at the sewing machine and not have to get up after each seam is sewn. Definitely allows for more efficient work flow. 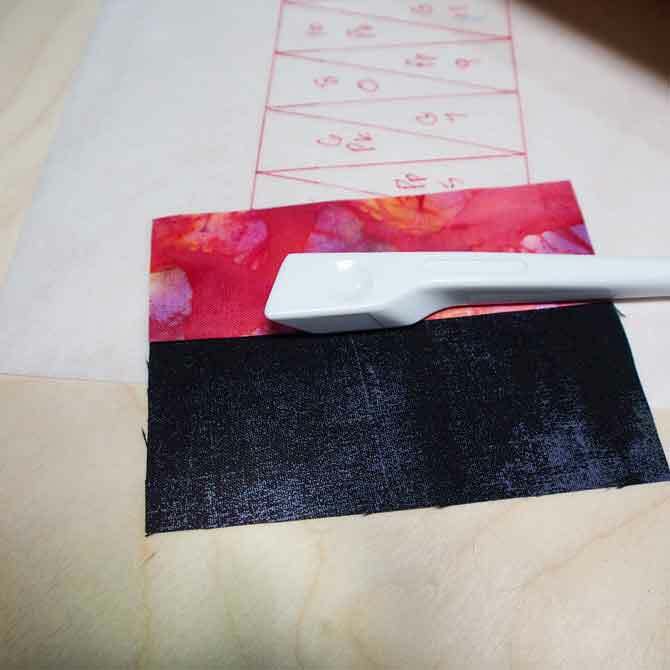 After pressing the fabric, the excess fabric needs to be trimmed off. 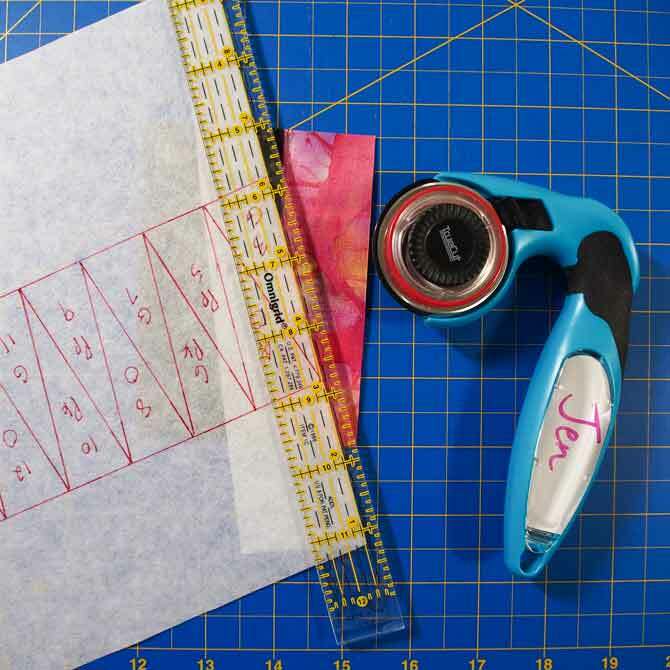 Fold over the foundation paper on the line next to be sewn on the backside, place a ruler on the fold at the ¼″ mark and use a rotary cutter to trim off the excess fabric. 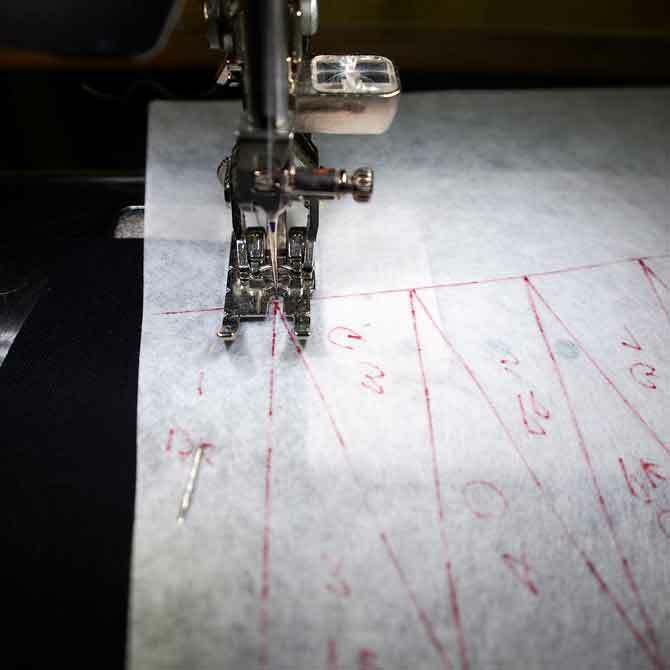 The piece is then ready for the next piece to be sewn in place with a ¼″ seam allowance already in place. 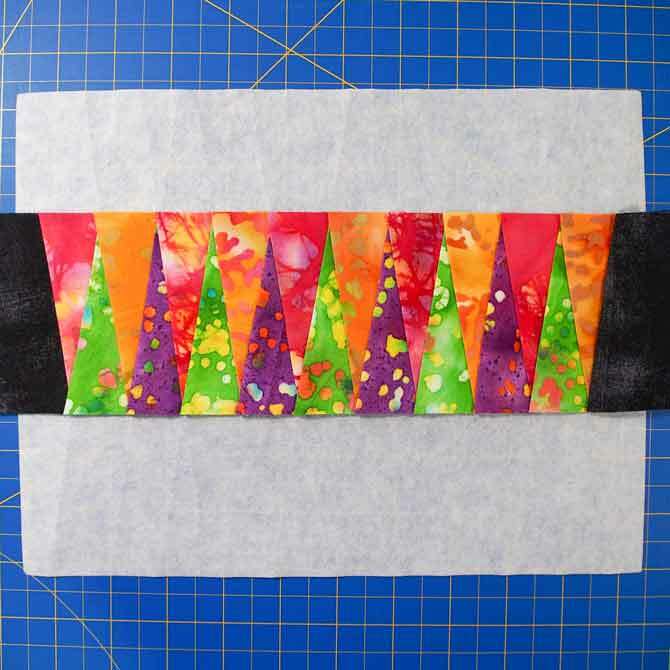 Place the next piece on the trimmed piece with raw edges meeting. Continue the process until the foundation piecing is finished. 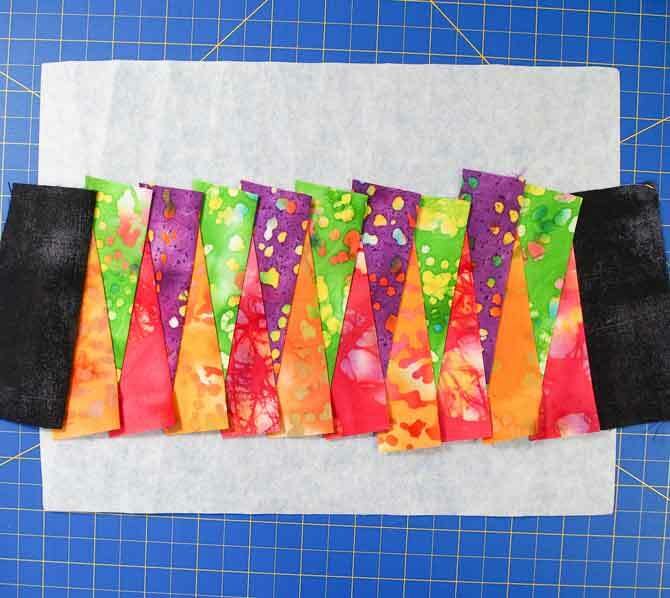 Square up the piece leaving a ¼″ seam allowance all the way around. The final step is to remove the paper from the back. 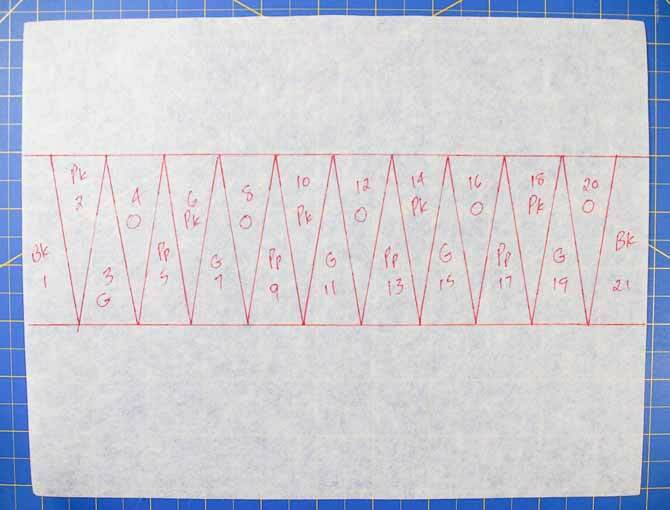 I placed a straight edge along the stitch line which made removal of the paper a cinch. I’m thrilled with this product, loved how it sewed with no distortion, was easy to remove and I’ll definitely be using it again for more foundation piecing in the future. I do own 4 French presses so of course each one will need it’s own cozy. 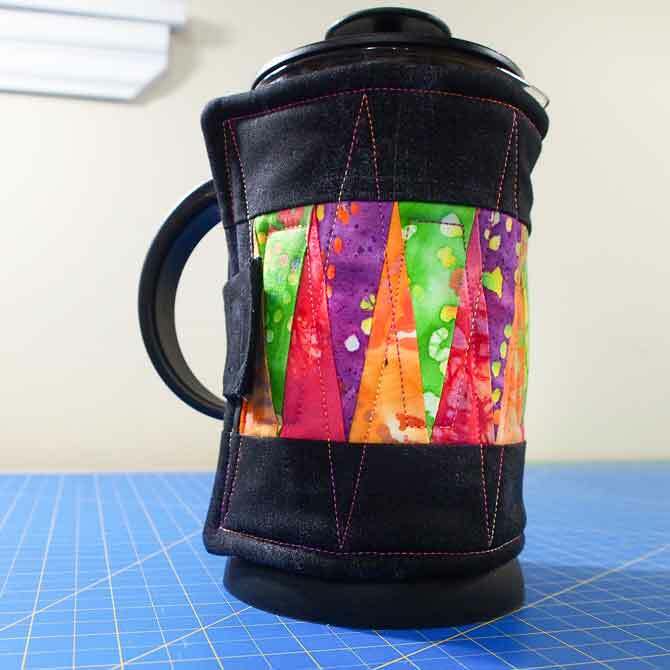 The top of the coffee cozy is pieced together with 2 bands of black – one on either side of the perfectly pieced triangles. 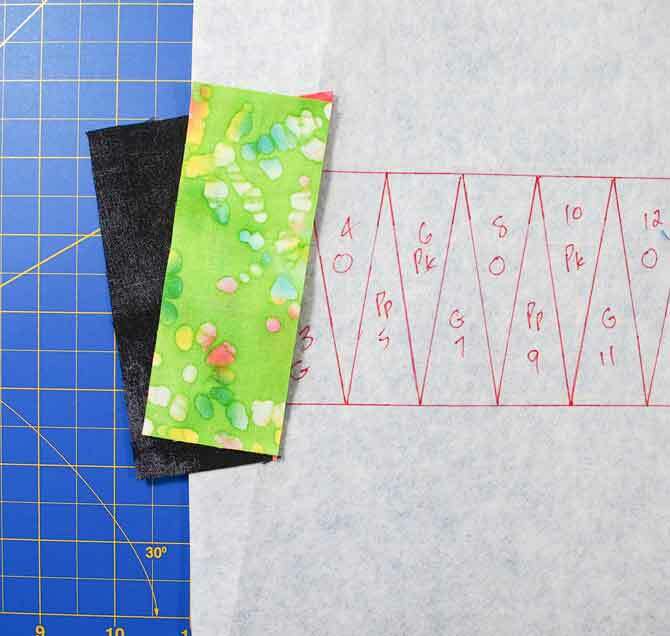 For layering the top, batting and backing I’m going to use the envelope method. With this method I don’t have to put a binding on to finish it. I’m also going to use 2 layers of batting for extra insulation on those cool spring and autumn mornings. 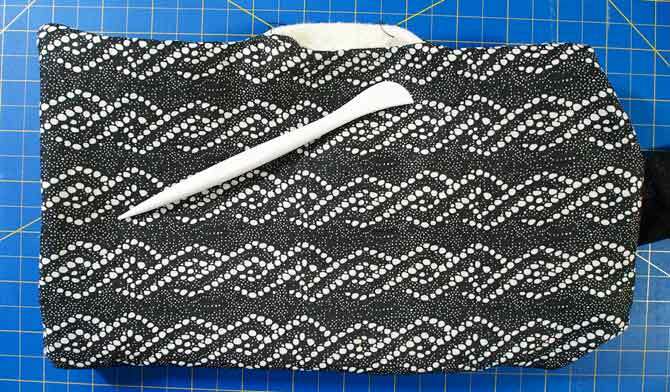 Once the layers are sewn together and the layers are turned right side out the corners will need to be poked out. I used this handy dandy point turner and the pointed end turned those points perfectly. Here’s the piece quilted using Sulky Blendables 30 wt cotton thread. 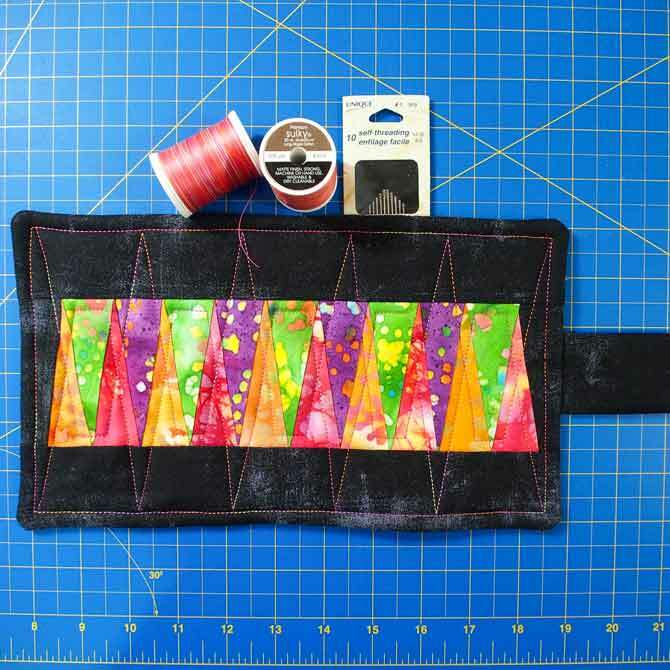 I switched to 90/14 Topstitch needle to do the quilting as I was using a thicker thread and going through 4 layers since I used 2 layers of batting. I had a few threads to pull through to the back with my self-threading needles. I do love self-threading needles. After trying to sew a buttonhole on my machine which I have to say I have never done because I never sew anything that requires a buttonhole, I was rather unsuccessful. So rather than try and figure it out, I used velcro to secure the tab to the body of the cozy and called it done. My bright, cheerful and colorful cozy will be used many, many times I’m sure and the triangle points are perfect. Foundation piecing equals perfect points every time. Foundation piecing has attracted but intimidated me for years – with your clear tutorial I think I will at last give it a try – thank you. Thanks for the great tutorial! The photos make the whole process exceptionally clear! 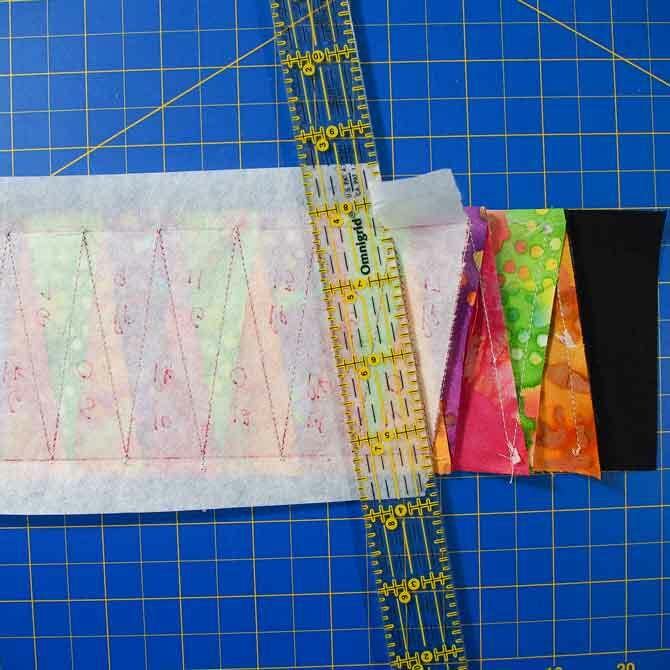 I love foundation piecing and it’s always great to get additional tips – thanks! I love the perfect points I get when I use foundation piecing. It’s my favourite way to piece now. Very cute method – I like it!! 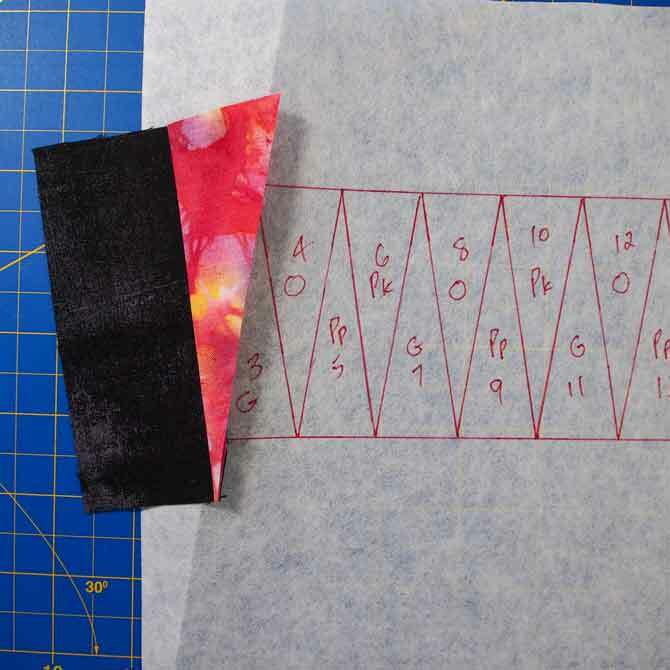 I love the precision of foundation piecing – but is there any easy way to take the paper off!? Foundation piecing is my favorite way to make a quilt top. The blocks are square and the quilt top is square when you put the blocks together, no wonky corners!